Tibet has often been cited as the true location of James Hilton’s mythical fantasy land of Shangri-La. Between the mountaintop prayer flags, monasteries of chanting monks and wafting insense, you can really appreciate the likeness – although perhaps not so much now with the Chinese troops on the streets and jarring horns from each passing motorbike and car. However, as we crossed into Nepal at the border town of Zhangmu, there seemed to be more of a resemblance to the modern day imitation Shangri-La at Glastonbury Festival than that of 30’s literature. Darkened alleyways with flickering florescent lights; narrow streets lined with mysterious shops bearing indecipherable Chinese script; sanitised quarantine zones for immigrants with quasi-english directions; and salubrious red-lit doorways with ‘hostesses’ awaiting their next customer. Ok, Glastonbury doesn’t have the last bit, but its sensory overload night venue is a fair representation of the contrast we saw in the last night we spent in Tibet. We’re now in Kathmandu, Nepal, collecting our thoughts and future plans before embarking on the next step of the adventure. We arrived on Sunday after a journey through a landscape that felt more like Costa Rica than our expectations of a landlocked plateau. The border was both classic and bureaucratic. A single lane bridge over a river cut through a deep gorge, with soldiers from each side arranged next to the line of control – the stuff of Cold War movies (or the opening sequence of Die Another Day for the younger generation). Then a laborious hour-long process of form filling, stamping, correcting, re-stamping and finally getting the signature of the chief immigration officer, who has to personally sign each visa. By hand. Not that the visa was actually needed to enter the country – the visa office was just a door on the street that we could well have just wandered past and into town if we didn’t have a guide with us! The Costa Rican element of the journey came from the glorious green forest cut by a wide river, around which our dusty and landslide-evident road wound and precariously leapt. Luscious, balmy and humid – none of which I’d have previously thought would fit Nepal. Oh, and cramped, sweaty and bumpy on the bus, which fitted the bill more! So we bade our farewells to The Rooftop of the World, and to the great friends we’d made on the trip from Beijing. We’re hoping to catch up with some folks in Delhi in a few weeks time, and others hopefully back in London – or elsewhere in the world. It’s strange to think back now to three weeks ago, indulging in Peking Duck on the first night, and the experiences we’ve had since then – seeing hundreds of people doing salsa/chinese crossover dancing on the streets of Beijing at night; shopping in The Gates Of Hell (massive supermarket, I’ll explain another time); crazy food – and being ripped off – at the night market; friendly shared gestures and photos with Buddhist Nuns; and the sight of Everest at last after the longest bumpy road imaginable! Kathmandu feels so much more like India than China, with brightly coloured hand-painted adverts covering shop shutters, the continual screech of car horns (often musical), and the fabulous wafting smell of curry. It’s a lot more frantic and noisy than I’d imagined – probably closer to my vision of Bangkok than a centre for trekking. Each narrow street of the Thamel district is teeming with honking motorbikes and rickshaws jostling for space among the pedestrians, and it’s easy to get a headache after just a few minutes. We spent a final night basking in the delights of a hotel room (with windows on three sides, no less!) before downgrading yesterday to a twin room at a hostel (en suite) for 1/10th the price. Cell-like – yes, in need of a good clean – definitely, but cheap as chips at £3 each per night. And with wifi and a rooftop view over the valley – bargain! 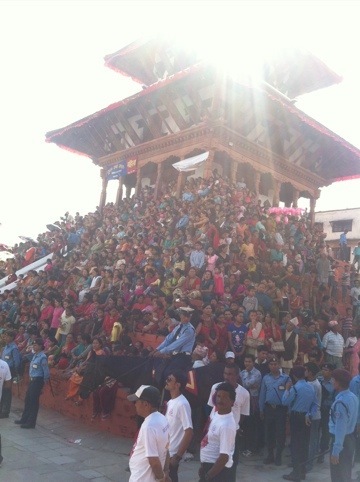 Yesterday we accidentally* wandered into the middle of one of Nepal’s biggest festivals, which was bemusing. Appropriately we arrived just as the various ambassadors of the world were driving up to palace in the main square here, and we slotted into the peculiarly prominent tourist area, waved past lines of riot police tasked it seems with holding the locals back from seeing their own festival. In short (this post is way too long already, but I’ve got to finish this now! 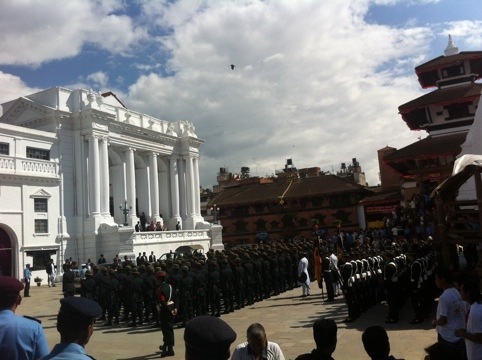 ), six year old living goddess, her feet can’t touch the ground, she gets out once a year – on this day – and rides a chariot (people, not horse-drawn) around the old town after blessing the president for another year of rule (it used to be the king but that stopped after he massacred his whole family ten years ago). Oh, and a dancing elephant (more people, not real animals), and man with a huge red hat. For three hours in the hot sunshine. It was certainly an experience! Then a final dinner with the remaining Gap Tour folks who had stayed an extra day. Today we procrastinated and sat out on the roof garden of our hostel, admiring the view while Laura beautified her scrapbook and I watched a huge raincloud wash in over the valley. It’s lovely and (relatively) quiet here compared to the bustle of the Thamil area 5 minutes walk away – the distant car horns sounding more like quietly bleating sheep, fitting nicely with the surrounding vista of green hills and dreams of mountain passes and trekking adventures. Tomorrow we need to actually plan our trek and start the journey onwards – but for tonight, it’s a cosy meal somewhere easy and then curling up with a book, possibly by candlelight if the one of the city’s regular power cuts sweeps in before we sleep. * Apparently we were told about it by some friends from the trip, but I’m denying all knowledge. One of the stereotypes about China I’ve heard many times is that of a smoke belching, coal guzzling giant. Its massive need for electricity following rapid industrialisation, and the plentiful supply of fossil fuels from it’s vast natural resources means that it is a huge polluter – and one that has an image of being reluctant to adapt to the growing concerns around climate change. Like many other nations, China plays the development deficit card – if the west was allowed to use so much carbon dioxide in getting to its current level of wealth, surely it’s fair to do the same in playing catch-up. Cue a discussion involving modern technology being vastly more efficient, questionable phrases like ‘clean coal’, ‘carbon capture and storage’, and what fairness really means in a world that is currently consuming at twice the rate that is globally sustainable – but where most of that consumption is being done by a small proportion of the population. In that context, it’s been interesting to see a surprising number of green shoots of renewables on our journey. Almost everywhere we’ve been, rooftops are decorated with solar water heating, the distinctive cylinders above a slanted set of pipes producing a pretty pattern in a panorama across the roofs of Lhasa. On our train journey across the interior, we passed wind farm after wind farm, with huge turbines lying on the ground in places ready for assembly. In Tibet, it’s been fascinating to see the streets frequented by solar kettles alongside the motorbike shops and smoke belching tractors. Our guide was telling us that the parabolic mirrors with a kettle suspended in the middle used to be made of cement and take a few people to move around, but recent innovations mean they’re a simple aluminium dish on a portable frame. 20 minutes to boil a large kettle in the high altitude sun – not bad for free energy! Oh, and Laura reminds me – electric vehicles. The alleyways and side streets here are disarmingly quiet (certainly compared to the cacophony of horns and engines on the main roads). Almost everyone seems to be using electric bikes – from your electric motor-assisted regular cycle, to pimped-up motorbike-sized things. And all absolutely silent. A few times we’ve nearly walked into the path of them (on the pavement, I should point out) because you just can’t hear them coming. I know electric bikes are becoming more common on the streets of Britain, but it’s us playing catch-up here. I’m sure renewables remain a drop in the (rising) ocean – and many of the pressures to adopt these technologies are financial rather than environmental – but in a land where even in the fresh mountain air of Tibet the locals wear face masks for fear of pollutants, it’s easy to over-apply a single stereotype. You don’t need to travel here to realise that modern China is about growth and immense scale – but seeing it for yourself really does bring it home. The Great Wall seems to have set the tempo. If a book ‘The Great Wall for dummies’ existed, the first fact it would tell you is that it was not one contiguous wall, but many individual sections, broken up by mountains and other impassable landscape. (The second thing it would tell you is that it’s only as visible from space as motorways, which are wider – and there’s no chance of seeing it unaided from the moon, as has been claimed.) 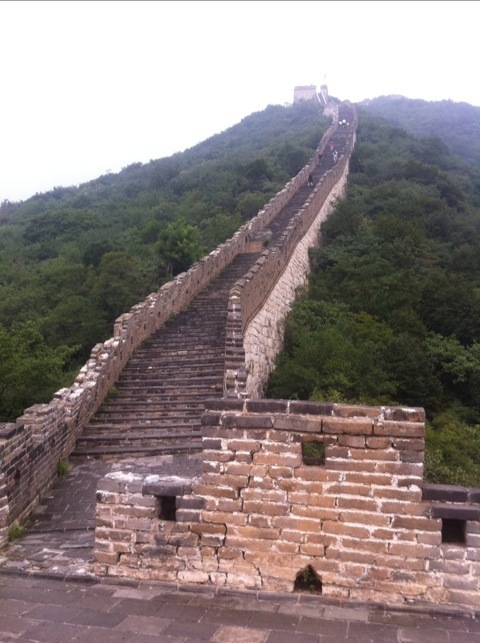 However, saying that The Wall doesn’t go over mountains somewhat understates the effort involved in constructing it. Remember, this is the land of Everest – the sheer, near-vertical rocky ascenders would certainly be called mountains back home. The gentle stroll we were expecting up to and along the wall was anything but – see the photo for a sample of it. It feels a bit like there’s an attempt to prove that humankind owns and hence dominates the natural world no matter what nature has thrown at us. Take electricity pylons for example. Conventionally you’d expect them to follow the path of least resistance – alongside the rivers that cut valleys through the rock. Not here. Some planner has taken a contourless map and a ruler, and just gone for it, meaning that certainly around the major cities the surrounding mountains have glistening silver monuments to modernity adorning their peaks. I pity the construction workers; nothing short of a helicopter could have been used to shift the materials into place. 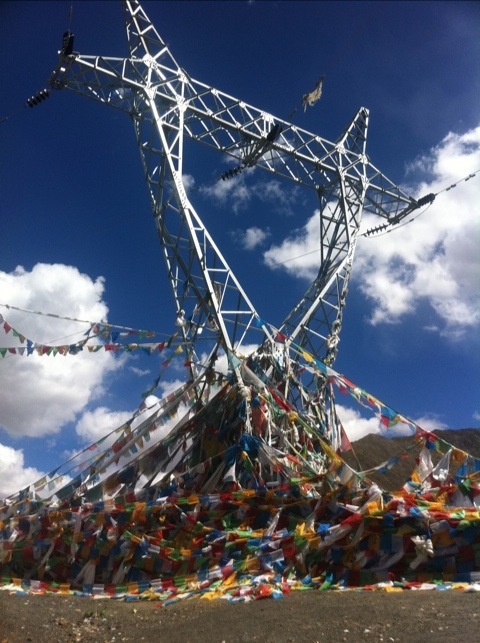 Even in calm, prayer flag laced Lhasa, the scale of construction is huge. Opposite the hotel where we were staying is a mammoth building site, where they’re constructing the latest shopping mall in China’s enthusiastic embrace of capitalism. Laura thinks I’ve become obsessed by what I’m about to tell you – but let me assure you, it’s nowhere near her addiction to bells (and fountains). My fascination? They’re using A LOT of water. I don’t mean ‘oh, I left the tap on’, or even ‘let’s run the industrial sprinklers for hours every night’. This is an order of magnitude above: install a whole new set of water mains running above ground for miles across town from at least two different sources. 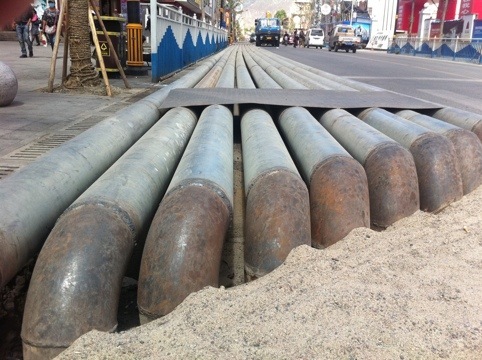 These mains are massive – six or eight welded steel pipes of say eight inches in diameter, running into the distance along the pavement, complete with car-ramps, troughs in the roads so they can cross – and, being spot welded around us while we were there, pedestrian-friendly steps over them. This maze of pipes ends up in four huge water towers, one at each corner of the construction site, into which we could see torrents of water gushing day and night, only to mysteriously vanish again through a network of pipes into the ground around the construction site. Perhaps they’re creating the world’s largest underground swimming pool? Who knows. This wasn’t what I was thinking of when I said that migration and modernisation was diluting the local culture! Even the Great Wall has its accoutrement to modernity – a toboggan run from the top down to the car park in the valley below, which we dutifully took in the name of research. I’m not even going to mention the Ilisu Dam. 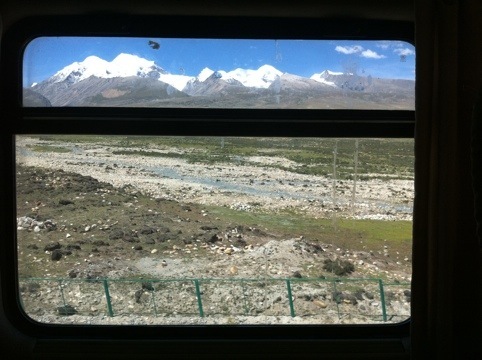 The irony is that as I write this, the busy road from Lhasa has turned into a bmx-style dirt track, with our bus becoming a temporary rollercoaster. For all the prosperity in modern China, it remains a country with extreme contrasts – gleaming urban skyscrapers against a backdrop of massive rural poverty. It may well be the world’s next superpower, but it is one whose GDP is the same as that of Namibia, at $6,000 a year. Multiply that up by 1.4 billion people and you have something colossal – but then when you think of a landscape that stretches from the Himalayas to the Straights of Japan, you realise just how spread out everything is and in reality just how little has been tamed let alone dominated by humankind. 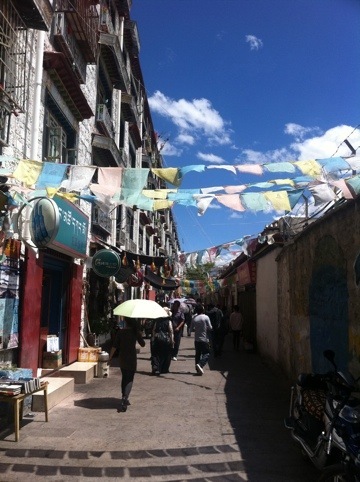 Lhasa might not be a million miles from Beijing (it’s 1500 or so according to my GPS) – but it’s certainly a world apart. Tibetan prayer flags adorn the streets, the people smile at you and are inquisitive, and the Chinese army are on every street corner. We got here a few days ago, and have been enjoying soaking up the atmosphere while also getting used to the lack of it in a physical sense. 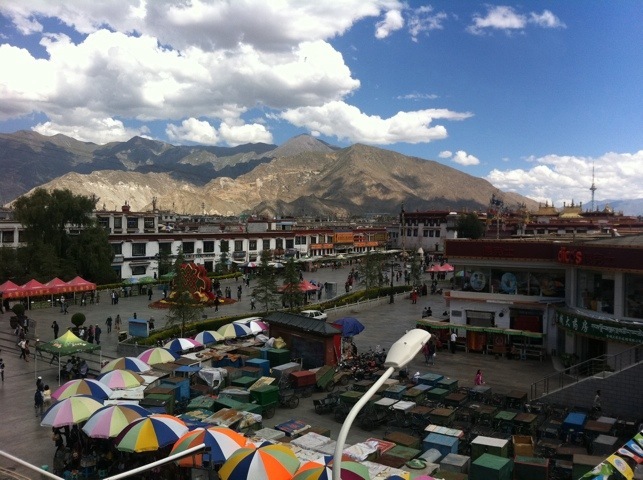 Lhasa is at 3600m, which is high enough that you can feel the reduced oxygen – we’ve both had headaches since arriving, and Laura’s having trouble sleeping (and this time it isn’t due to all-night partying!) The advice is to drink plenty of water, rest – and to take Diamox, which aids the body’s absorption of oxygen while enough red blood cells are being created to help out. Fortunately, comfy hotel beds and a pretty chilled out traveller-friendly city makes this a nice spot to rest, although it would be slightly nicer if our hotel room overlooked the delightful courtyard garden at the back rather than the building site and car-horn-aplenty main road at the front. The patrol – normally five soldiers, marching in unison, with white gloves, full body armour, and often riot gear. Between them they tend to carry a few rifles, a shotgun, and what appears to be a tear gas grenade launcher. Oh, and one has a shiny red fire extinguisher strapped to his back, since self-immolation is a common form of protest. Strangely though, they do give way sometimes when the street is crowded. The box of troops – imagine a small plastic greenhouse, with all the windows shut, surrounded by hazard tape, sitting on a street corner. Now fill it with soldiers in camouflage gear. I’ve heard of guerrilla gardening, but this is something different! 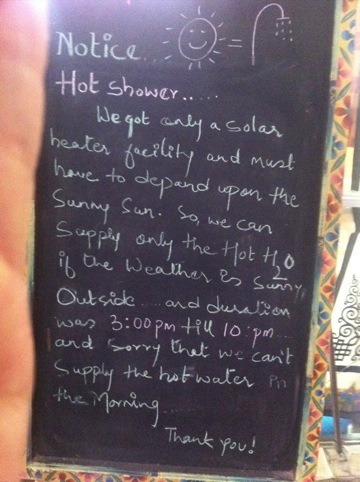 Given the sun is very hot here (due to the altitude), it must be like a sauna in there. Maybe there’s a hidden ice-cold plunge pool nearby. The stage standers – I find this one particularly bizarre. Take a small stage block, say 50cmx50cm, by a mere 20cm high. Paint it bright red, and put a beer garden-style sunshades above it (we’re pretty certain the writing says some pro-Chinese slogan rather than just ‘probably the greatest beer in the world’, but could be wrong). Now stand on it, from your lofty (remember, 20cm!) vantage point and stare into the distance while standing to perfect attention. We’ve been trying to see if they’ll respond to a cheesy grin as we walk past, but so far haven’t succeeded. The silhouettes – every now and again, against the beautiful skyline of soaring mountains and a brilliant blue sky, you see the outline of a couple of soldiers under another beer garden umbrella. Presumably they’re admiring the rooftop scenery. Despite the very visible army presence, this place clearly does have a lot of love. Everywhere you go, there are warm smiles from the locals, and wandering the lovely street market stalls in the Barkhor area surrounding the Jokhang temple, there’s none of the pressured selling we experienced in Beijing, just friendly hellos and questions about where we’re from. More on the sights, food and, well, yaks later – we’re off to find our first Tibetan geocache and hopefully grab a nice chocolate brownie and a cafe down the road. It’s 7am, we’re on day two of the train journey across China and I’ve just seen the first snow-capped mountains in the distance. We were helpfully woken a few minutes ago by all the lights being switched on, just as dawn was breaking outside. All of China is in the same time zone (Beijing time, naturally), it should really be quite a bit earlier than 7am (it’s midnight in the UK). Let me describe the world around me right now. Inside the train, we’re in a six person sleeper car, I’m on the bottom bunk, and Laura’s somewhere way up above on the second story, next to the air conditioning on the roof. 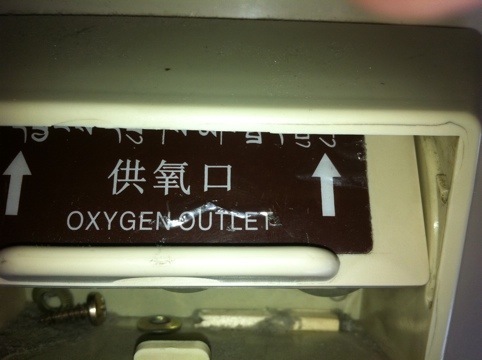 There’s oxygen being fed in through a panel next to each bunk (they switched it on last night as we started ascending properly to the 5072m pass we go through this morning). Our cabin is at the end of the carriage, which means the smells and sounds are less serene – every 30 seconds or so there’s the sound of someone hocking and spitting, and the smell is overwhelmingly of cigarette smoke, as people can smoke in the gap between carriages – but since there are no doors, and the windows are all shut due to air conditioning, it just wafts down to us. In contrast to the cramped and smokey interior, outside is a wide open plain, with mountains in the distance and a vast foreground of grazing land, occasionally punctuated by shepherds in white tents with their flocks, and the occasional lorry on the road running alongside the track. The sky fills much of what you can see, a smooth gradient of blues against the rough and varied landscape beneath. If there’s one thing this journey makes you realise, it’s that China is awe-inspiringly huge. The 36 hours so far have seen the whole range of landscapes: urban Beijing with its skyscrapers and smog; desert replete with sand dunes studded with wild grasses; wide brown rivers swirling amid rust-red hillsides with corn growing in the fields as far as the eye can see. And now, permafrost – desolate freezing planes iced with a hint of snow, and the odd line of tibetan prayer flags amid roaming herds of animals. This railway is seen as a crowning accomplishment of modern China (although the Tibetans understandably do not feel the same way). It’s the highest altitude railway in the world, and was only completed in 2006 after some unlikely engineering – two oxygen ‘factories’ to supply the train, 675 bridges spanning 160km, and networks of pipes feeding liquid nitrogen into the ground beneath the track – to keep it frozen and stable during summer. Oh, and it goes through an earthquake prone region, so there are seismic sensors along the track. And the cost? A whopping $3.6 billion USD. As our guidebook clearly points out, this is all a part of China’s plan to further tether Tibet to the rest of the country, encouraging greater migration and hence diluting the Tibetan culture and further undermining regional autonomy. This might seen like an obvious Bad Thing, but it poses some interesting questions about development. We live in an ever more connected world, as modern transport and communication break down barriers, creating more of a melting pot – and when done badly, taking away the identity and culture of individual peoples through this process. But how should modern developments be embraced responsibly? Who are we in the west to deny the benefits that come with greater transport, trade and communication, even if that does mean the traditional way of life is changed forever? Our guidebook makes another interesting point – increased interaction has meant that more Chinese understand and appreciate the Tibetan way of life, to the point that they want to preserve it in its own right. The thinking goes: if you don’t feel threatened by something, you don’t need to try and destroy it. What happens to Tibet and it’s unique identity remains to be seen – but it’s pretty clear that the region is on a journey just as interesting as the one Laura and I are on.